A concise history in English of Bugatti cars ever been in the Nordic countries or owned by Nordic citizens from 1912 to the present day. Several cars, still existing today, are now in the hands of owners all over the world. Thus the Register is relevant not only for Nordic citizens but also other person globally. 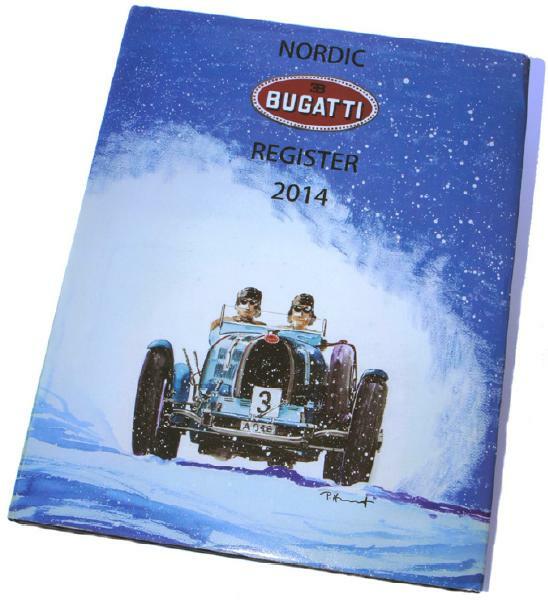 The Nordic Bugatti Register 2014 comprises some 200 individual Register Pages of each Bugatti car that has at one time or another been owned by one or several individuals in the following Nordic countries: Denmark, Finland, Norway and Sweden, from the first owner, or ex-Bugatti Works, to the present day, provided facts exists. Each Register Page typically includes: Chassis and engine numbers, extracts of the original Bugatti Works data sheets, delivery dates, time of acquisition by the present and former owners. A concise history of what has happened to the car during its existence in one or several of the Nordic Countries is included. Each car is illustrated throughout with 3-4 period and contemporary photographs per car, in b/w or colour. The information has been compiled by the Nordic Bugatti Identification Group consisting of Bo Söderberg (Registrar), Per Hörlén (Registration Secretary), Lennart Haajanen (Finland and Sweden), Ole Kristian Haugen (Norway), Per Henricsson (Sweden), Per-Olof Håkanson (Sweden), and Frank Studstrup (Denmark).